Welcoming 6 bedroom holiday home to sleep 14. Ideally located near Calvi, Corsica. 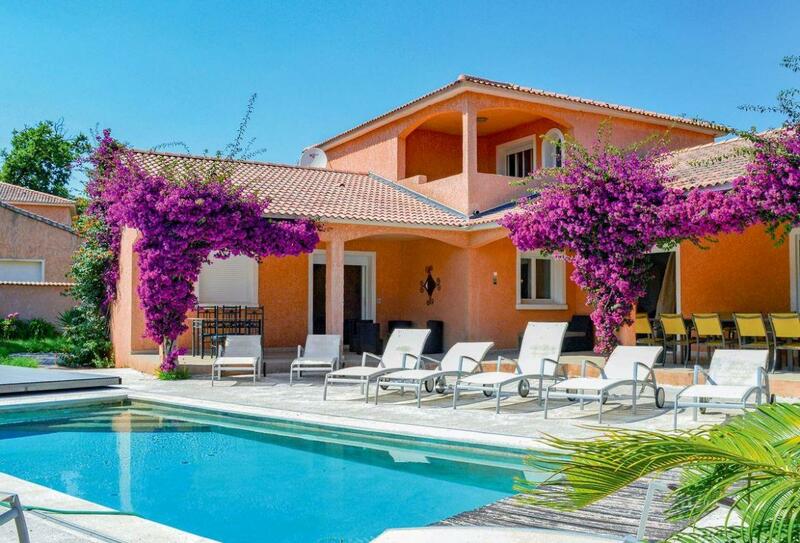 This holiday villa offers a brilliant private pool to relax, play and soak up the sun! You’ll be staying only a short walk or drive away from the beach. Air conditioning. On site parking. Cot available. Highchair available. Restaurant nearby. Airport within 1 hour. Pets not accepted. This sumptuous villa for 14 people is located 300 metres from the beautiful end of Moriani-Plage Beach. The property is spacious with light and airy rooms and with air conditioning. The ground floor of the holiday accommodation comprises 4 bedrooms, and a first floor with a second kitchen and a further 2 bedrooms. The beautiful private outdoor swimming pool and garden make it a perfect place for a relaxing holiday. The holiday home is situated in a holiday complex where there are games for the children. Visit the wineries where you can taste the excellent Corsican wines; the ancient city of Aléria; the unique Mediterranean Saleccia Gardens or the old historical town of Bastia.